Though I’m still crappy at getting research done and that’s not likely to change in the near future, I have a little more time to myself now and I’ve actually been able to keep up with the Summer season. I’m enjoying it a fair amount, so I just thought I’d put up a quick list of which anime I’m really enjoying at the moment. I haven’t really kept up on posts of what I’ve been watching this season, so I wanted to put up a quick post just listing what I’m keeping up with thus far. Split the list into tiers based on how in love with/likely to finish the show I am. I love To Heart: The Anime, straight up. I love it because of the anime, period; I’ve played only part of the game, avoided the blatant cash grab that was Remember My Memories, and straight-up ignored anything related to the name with a 2 next to it, because why would one take characters that good and replace them? I maintain that it is a rational love for a great product – it averaged 10k in an era where far fewer series did per year per total number shows produced, and is one of relatively few TV anime to boast a page on sakuga@wiki – but ultimately enjoying a series past a certain extent is an emotional thing. I’m not going to try to convince anyone else that they have to love it, but I am going to talk about it for a bit more before going to the season-summary capsules that motivated my latest rewatch/quote-mine experiment. The above were the two scenes I felt survived the pull out of context the best. As minimalistic as it was, To Heart was also a very visual show, and so finding quotes that worked for every show I’m watching this summer was a bit harder than grabbing those clips, but the show’s dialogue isn’t exactly shabby, just frequently dependent on context. That said, I was able to get enough to go by, so if you’re at all interested in a combination of quotes from a [phenomenal] 1999 show I love way too much and my opinions on a bunch of shows that are airing right now in September 2014, read on. I spent most of today working, being ecstatic about Lebron James leaving Miami, and then dealing with a Chris Bosh-shaped knife in my back. 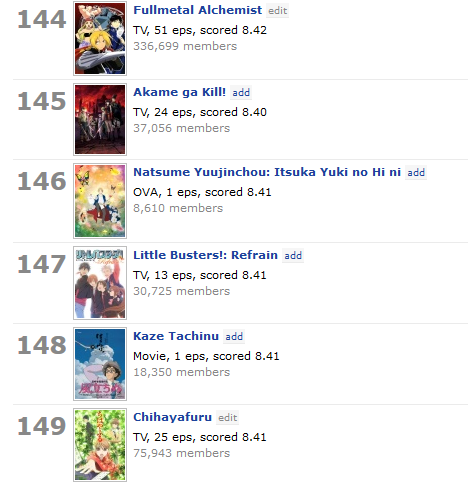 * Anime’s happening, though, with today’s new stuff being of the super-volatile variety. I went all-comedy this Sunday, and am saving Akame ga Kill for tomorrow. The three new shows that I did watch will make a fun enough slate if they follow up on the level of their opening chapters.